The other day I recieved something wonderful in the mail. 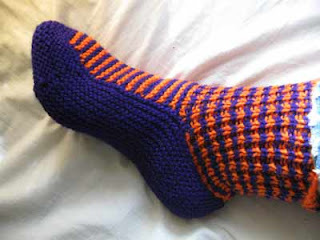 I’d been talking to a friend of mine’s mother, who knits her grandson all sorts of clothes, and I jokingly said to her “Oh, you should knit me some socks while you’re at it!” She laughed, I laughed, and the story was forgotten. How beautiful are they? They’re actually purple and orange, the camera couldn’t capture the colour properly. 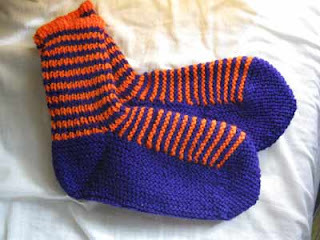 HOw wonderful is she, to have gone away and knitted me socks? I was so touched. So I’m going to make her some jam in return. In random news, my article on how to organise an exhibition is now up at Artstuff (artstuff.net.au) If you haven’t seen it already you can view it here.